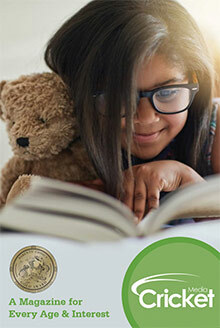 For almost 40 years, Cricket catalog has introduced their catalog and coupon code savings to millions of children with the wonders of reading and writing, featuring award winning publications for every age, passion and interest. Magazines - Cricket is one of the leading sources for young readers, offering fourteen award-winning magazines and hundreds of books for kids, with titles that cover all ages and subjects. From toddlers to teens, literature lovers to science fanatics and history buffs, you'll be sure the find the perfect publication for your child, no matter where their interests lie. From Ladybug and Click for younger readers to Cobblestone and Calliope for older kids, Cricket magazines for children showcase the writing of only the finest world-renowned authors and artwork from a team of exceptional artists, making them the perfect gifts for every avid reader on your list. Books - Inspire young minds with childrens books that will capture their attention and leave them thirsty for more. Whether you're shopping for board books and pop up books for preschool and primary readers or vampire and fantasy titles suitable for tweens and teens, you'll have access to a vast library of titles that will put them on the path to learning and fill them with the joy of reading. Gifts - Give a gift that will help them learn and grow with an award-winning collection of books for kids, crafts, toys, activities, puzzles and gifts that will engage and excite young minds. Shop conveniently by age for the perfect Cricket magazine, book, toy or treasure for children up to 3 years of age, ages 3 to 6 or 6 to 9, plus titles for bigger kids ages 9 through 14 and up. Digital Editions, Apps & eBooks - Take your child's learning and reading experience up to a whole new hi-tech level with a tablet friendly selection of digital editions that feature everything they love about their print magazines, and tons more. Download a digital edition for your iPad at the iTunes store, or add one to your print subscription to enjoy the best of both worlds. You'll also find fun apps for kids and an ever growing selection of eBooks for your tech savvy readers to enjoy. Since 1973, Cricket magazine has delighted and excited young readers of all ages, with amazing publications that have received numerous awards and honors, as well as volumes of praise from parents, teachers and children alike.